What is a Swedish dishcloth? Why would you want to use one? Which is the best Swedish dishcloth? I had a lot of questions about Swedish dishcloths! I’ve heard they are a cheaper and healthier alternative to sponges and paper towels. So what’s all the fuss about? I’ll tell you 7 reasons you’ll love Swedish dishcloths! What Is a Swedish Dishcloth? A Swedish dishcloth is like a cross between a sponge and a dishcloth. It’s like a very thin sponge that is the size of a regular dishcloth (around 6″ x 8″). They’re made of a mixture of cellulose and cotton. They’ve been around in Sweden since the 1950s and have been popular in Europe for decades. Recently, they’re gaining popularity in the United States. The most popular and widely available Swedish dishcloth brand in the United States is the Wet-It brand. What’s the difference between a Swedish dishcloth and a sponge cloth? 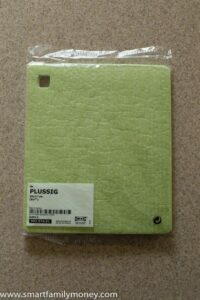 Sponge cloth is another name for a Swedish dishcloth. If it isn’t made in Sweden, it’s probably going to be called a sponge cloth instead. What Did My Testers Say? I passed out Swedish dishcloths to 3 moms of young kids and 2 grandmas. Overwhelmingly, the response was that everyone really enjoyed the way the Swedish dishcloths felt in their hands. There were a lot of comments about how they feel so nice when you wipe things with them. It’s hard to describe until you feel it yourself, but it’s a “luxurious” feeling. When they dry, Swedish dishcloths harden and form into odd shapes. If you hang them over your faucet, they will often fall off when they’re completely dry. If they dry in a curved shape, they are very odd-looking and tough to store. The testers didn’t feel this was a deal-breaker, but they were trying to figure out some solutions. The other comment was that if you wash dishes with the sponge cloth, you would still need something else for scrubbing stuck-on food (scouring pad or brush). Swedish dishcloths are not good for scrubbing pans with stuck-on food and you will quickly destroy them if you try to use them that way. Everyone was a little skeptical of the dishcloth at first. but in the end, they were all pretty impressed. All my testers really enjoyed their Swedish dishcloths! Swedish dishcloths are very easy to wash, sanitize, and use again. They require no special care. Swedish dishcloths just FEEL GREAT. Trust me, you’ll like it! They can be used for cleaning, washing dishes, wiping surfaces, and cleaning up spills. They can replace many jobs you might use a sponge or paper towel for. Swedish dishcloths last a long time and reduce waste from sponges and paper towels. They are expected to last 200-300 washes or about 6-9 months. They dry very quickly, so they don’t allow bacteria to grow on them (unlike sponges). Since they are made of natural materials, they will biodegrade. How Do You Wash a Swedish Dishcloth? Simply rinse and let dry in the kitchen for everyday use. Wash on the top rack of the dishwasher. Wash in the washing machine. Can also be dried in the dryer, but air drying is recommended for longer life. Microwave while wet for 1 minute to sanitize. How Do You Store a Swedish Dishcloth? If you hang them on your faucet, they turn into a hard shape like a shell. Hang it over the faucet or sink and embrace the odd shape that it forms. 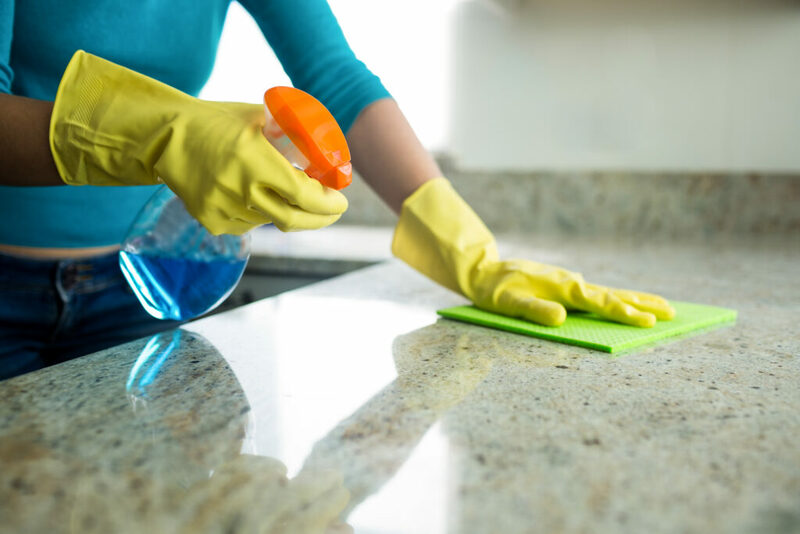 Lay it flat on the counter so it dries in a more manageable shape. It won’t dry as fast this way, though. Clip it up to dry flat. 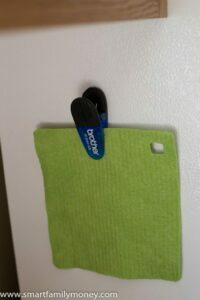 You could use a magnetic hook on your fridge or use this type of hook inside a cupboard. Hang it on a hook (if it has a hole or you punch a hole in it). Hanging them up with a magnetic clip works well. Which Is the Best Swedish Dishcloth? Not really sure what to use this one for. It’s too big to use as a dishcloth but doesn’t seem like a towel. Bottom Line: Which Brand Is the Best Swedish Dishcloth? 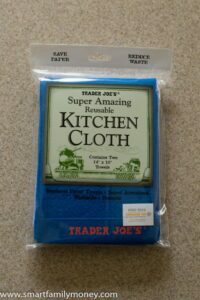 Honestly, other than the Trader Joe’s cloth, they seem remarkably similar. If I wasn’t comparing them side-by-side, I doubt I could have told which was which. Really, you can’t go wrong with any of these options! I can’t pick on brand as the best Swedish dishcloth! I was surprised that two of the brands of Swedish dishcloths (Scotch-Brite and Amala) that I tried felt soft in the package. The rest felt like hard pieces of cardboard. I thought maybe those brands would be soft when they dried. When I opened the packages, I discovered that they are simply packaged in a liquid to keep them wet. They felt wet like baby wipes. When I rinsed them out and let them dry, they felt hard, exactly the same as the other brands. 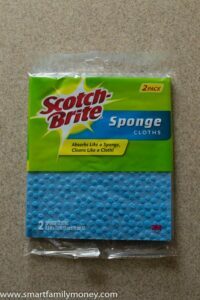 Scotch-Brite Sponge Cloths are packaged in a liquid that makes them feel soft. Don’t be tricked by packaging! Any variety of Swedish dishcloth or “sponge cloth” will be hard when dry. Some are packaged wet to appear softer. I was not able to find any Swedish dishcloths at my local Target or Walmart, but it’s possible I missed them. If you have found some there, please let me know in the comments below! Although the Wet-It brand of Swedish dishcloths is the most well-known, they’re by far the most expensive of the brands I tried. Other than their cute designs, they don’t seem to have anything superior to the other brands. 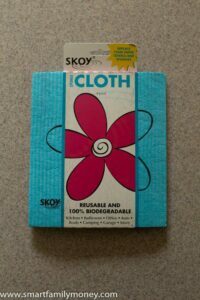 There are a number of other brands of sponge cloths available around $1-2 per cloth. Paying $6/cloth is unnecessary when there are so many other good-quality cheaper alternatives to Wet-It Swedish dishcloths. If you want something nearly identical to Wet-It, check out the Amala Sponge Cloths. Amala Sponge Cloths really feel identical to Wet-It for 1/3 of the price. It’s been almost a year since I first published this post, and I’m happy to report that I still enjoy my Swedish dishcloths! I still have most of the cloths that I bought for this review! I did have to throw away a few of them. Some got holes in them from aggressive scrubbing or accidental knife slices. A few others just got so dirty they didn’t come clean in the wash. I’ve found that cleaning the coffee machine with them stains them badly. I’m happy to report that I still love them and every brand has performed very well! Someday when I’m ready to replace mine, I’ll buy whichever brand is the cheapest! Have you tried any Swedish dishcloths? I’d love to hear your experiences in the comments below! Previous Post: « How Much Coffee Is In a K-Cup? 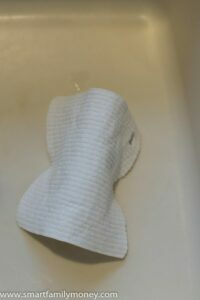 Could Swedish dishcloths be used to clean the toilet (using multiple cloths to avoid contamination), due to the fact that you can sanitize the cloths in different ways? I imagine you could. You’re right that there are a variety of options for sanitizing them. The only problem I see with using Swedish Dishcloths for cleaning is that they don’t scrub well. For example, I wouldn’t want to use them to clean my bathroom sink, because I need to scrub off toothpaste specks & soap scum. Personally, I love my e-cloths for that. I talked a lot more about e-cloths in my post about Cheaper Alternatives to Norwex. Oh great, thanks for the tip! 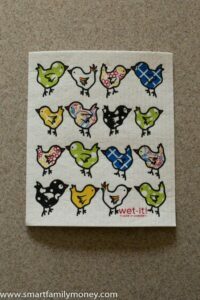 I have used Wet-It cloths for several years and I love, love, LOVE them (even though they’re pricey). I have a couple of them that are around 2 years old or so, that I only use for dirty jobs that don’t need scrubbing. And those babies are still going strong! To clean, I either boil them or throw them in the dishwasher, then lay flat to dry (because it really doesn’t take that long). Once dry I stand them up straight and store them behind my scrubber/soap/ brush holder thing where they barely show. I’ve always been hesitant to try another brand because the Wet-It’s work so well. I’m so happy to have tripped across this article, and now I’m anxious to try some others! (Love the mid-century modern designs which Wet-doesn’t provide.) So thank you, and I hope I’ve given others some storage solutions! I hope you like some of the other brands! Please report back if you can! I have been using the Ikea Plussig cloths for a couple years now and love them. You can’t beat the price point. I went to stock up at Ikea yesterday and it appears they have been discontinued. They also don’t show on the website. I’ve emailed customer service to enquire. If these are gone I will be so disappointed! So, if you seen any left at Ikea… stock up! Yes I was worried that they were discontinuing them! I have to say that they are a little lower quality than the other ones from Amazon I linked to though. I just came back from a trip to Sweden. Every Swedish person we stayed with had these and I was able to use them. I had never seen them before. I finally went to a store there and bought quite a few very inexpensive ones made by a company called Wettex. I have since found them on Amazon for about $2 apiece. I LOVE THEM!! Glad you are enjoying them! I will have to check out the Wettex brand.